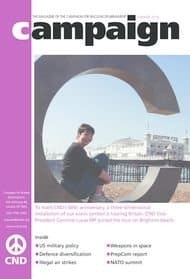 Campaign magazine is CND’s round-up of our campaigning work as well as guest articles on politically relevant topics: you can read the most recent issues below. 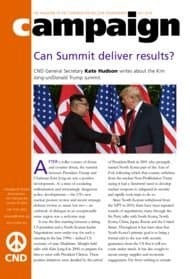 In this edition of CND's magazine, slightly dominated by US President Donald Trump, we look at his summit with Kim Jong-un and why CND will be protesting his visit to the UK. 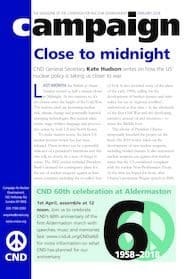 In this edition of CND's magazine, we look at the issues of defence diversification, air attacks in Syria, Trump's foreign policy, and much more. 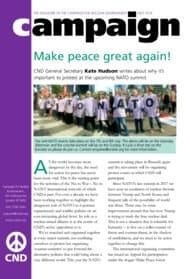 Kate Hudson writes about why it’s important to protest at the upcoming NATO summit and Sara Medi Jones calls on CND supporters to join the TUC national demonstration. Kate Hudson explains the successes and failures of the NPT, and Dave Webb highlights the importance of research into defence diversification. 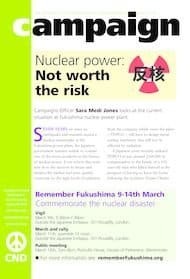 Sara Medi Jones writes about the current situation at the Fukushima nuclear power plant and Trident Ploughshares activist Lyn Bliss writes about the recent arms fair trials. 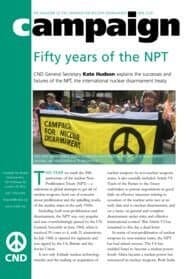 Kate Hudson writes about US nuclear policy taking us closer to war, whilst Sara Medi Jones reflects on the history of the CND symbol. 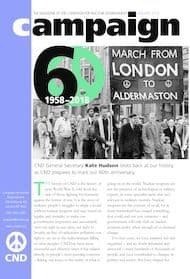 Kate Hudson reflects on 60 years of CND , Linda Pearson examines the role of arms companies in influencing nuclear weapons policy. 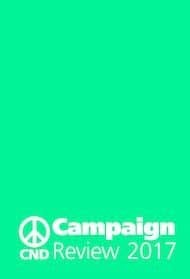 CND reflects on its campaigning and global events in 2017. Sara Medi Jones writes about current trends for protest t-shirts. 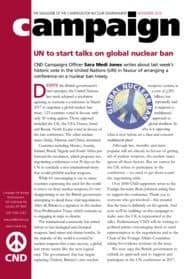 Rebecca Johnson reflects on Britain and the Global Nuclear Ban. Dave Webb ask the question ‘Is Trident obsolete?’ and Sara Medi Jones writes about why the government needs to change its disastrous energy policy.